One last finished project to share, and certainly my favorite: Juliet. 1. I made a size smaller than I typically would. It was a good thing: it really did grow with blocking. 2. To keep the hem and front bands from curling, I did a 6 row garter hem and 4 st garter band. I knit the 1st stitch through the back loop and slipped the last st purlwise wyf on every row for a nice edge. 3. I increased the length of the sleeves. I placed the sleeve stitches on a holder and later picked up 5sts under the arm and worked the sleeves in the round 7x. 4. I used 2 strands of yarn for the garter top and sleeves and switched to 1 strand for the lace body. I can't wait for our weather to warm up a bit so I can wear this! It will be great this summer with a tank top under it. 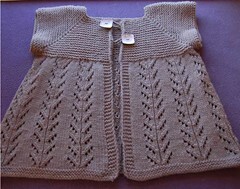 Comments: Quick and easy knit--very enjoyable!